A Brighter Future? 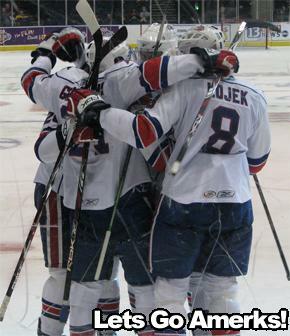 We Hope So... · Let's Go Amerks! When the Amerks only managed to put away 21 goals in the whole month of December (with only one win from the Hamilton Bulldogs), no one expected an inprovement coming into January.Â And at first, no one got one. The Amerks stayed winless in 2008 until this weekend when they took 3 of a possible 6 points and scored 12 goals in one weekend.Â Many things may be linked to these improvements in scoring. Another line showing a lot of potential is the newly revamped 4th line.Â Kenndal McArdle and David Brine have been showing that they can work well together and can score too.Â Kenndal had two goals this weekend, one coming shorthanded. Ever since Marc-Andre Gragnani has been moved up to playing forward, his stats have improved.Â He seems at home back in front of the net where he spent his junior career.Â He ended this weekend a +5 with 1 goal and 5 assists, where before that he was a -26. Mark Mancari has been seeing a lot more icetime lately also and is backÂ playing point onÂ the first PP Unit where he belongs.Â I don’t know what Cunneyworth was thinking when he moved Mancari to the forth line for a week but, I’m glad he got that out of his system. The Amerks Power Play and Penalty Kill Units have been playing much better as well.Â This weekend, the team put away two PP goals and one shorthanded goal with just two goals against when on the penalty kill.Â A major improvement over the month of December. The Penalty Kill Units didn’t have to work as hard as usual this weekend either.Â With 12 penalties in the three games combined, the team seems to be becoming a bit more disciplined on the ice.Â Although, Adam Dennis’ delay of game penalty with only 2:21 left in the game on Friday stopped the team’s chances of a comeback on Friday when they were only down by one goal. The team is going to have to continue to improve on the road this week.Â They are playing four games in the next week, all on the road. First, they go to Grand Rapids for two games there being played on Wed and Fri.Â The Amerks have handed the Griffins two loses this season.Â Â Now the Griffins sit in 5th place in the North Division with a record of 15-19-2-5.Â Both games start at 7:00 PM. The next night, the Amerks travel to play the Iowa Stars.Â They are in last place in the West Division with a record of 19-19-2-2.Â This game will be the first meeting between the Amerks and the Stars this season. All away games this week can be watched on the B2 network and will be aired live on broadcast live on Hot Talk 1280 WHTK andÂ whtk.com.